Charlie and the Corruption Culture. Charlie, you got some 'splainin to do." Maybe guys like Charles Rangel start with the belief that they’re going to go to Washington as an a reformer, clean up how Congress works and not succumb to the temptations of life in the Beltway. But anyone who holds power for 40 years is no longer a reformer. They have become the monster they came to Washington to slay. This week, Rangel, the chairman of the Ways and Means Committee “temporarily” stepped down after a House ethics panel found he broke House gift rules by accepting corporate-sponsored trips to the Caribbean. Rangel hasn’t been charged with any crime and says he’s not going to resign from Congress (does any politician say they’re going to quit before they have to?) , but with voters already in an ugly, anti-incumbent mood, Rangel becomes the poster boy for the Republicans who got hammered by the Democrats in 2006 and 2008 for their own corrupt Congresscritters. Charlie cops some zzzz's at his Dominican Republic villa. Every Democrat up for reelection that has even been photographed with Rangel, served on the committee with him or talked to him should expect to see themselves in an 60-second attack ad. What makes it even more delicious is the Republicans don’t even have to lie. Rangel’s ethical lapses include using a rent-controlled apartment in New York as a campaign office, not reporting income on tax forms and channeling favorable treatment for the Charles B. Rangel Center at the City College of New York. The National Republican Congressional Committee has targeted 71 Democrats who have accepted funds from Rangel’s political committees. Some commentators have floated the notion that Black politicians such as Rangel and New York Governor David Paterson are being targeted because of their race. Isn’t it just as likely that Rangel and Paterson are just being scrutinized based on the content of their character instead of the color of their skin? Black people have overcome to the extent that we’re comfortably entrenched in the halls of power in Congress. Rangel is hardly some fuzz-faced rookie. He’s done a lot of good for a lot of people in his four decades in Congress. Now he’s a liability. Rangel needs to not just turn in his gavel, but step aside before he morphs from liability to cancer. We can’t keep looking at racism for the reason Black politicians get a hot spotlight turned on them. Racism is among the reasons some Black politicians fall flat on their faces, but it’s also an excuse they hide behind. When a Kwame Kilpatrick, Sheila Dixon or Roland Burris screw up and embarrass themselves, they typically take themselves out with their own self-inflicted wounds and not from some evil conspiracy by “The Man” to take them down. Democrats can’t wag their fingers in sanctimonious outrage at Republicans and pull a “hear no evil, see no evil, speak no evil” to the transgressions of their elected officials. Voters are willing to forgive anything except hypocrisy and stupidity. Corruption is both non-partisan and colorblind. Rangel may not want to resign his seat based upon vague allegations and rumors, but there’s enough smoke to send both him and a lot of other Democrats crashing down in flames. 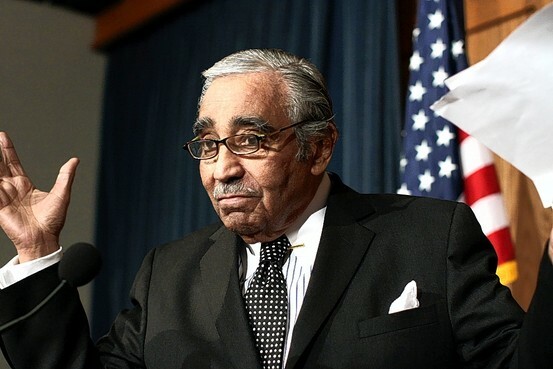 If he won’t go willingly, President Obama and House Speaker Nancy Pelosi will have to force Rangel out. That’s a steel cage death match that would bloody all involved participants, but it’s a fight Obama and Pelosi can’t back away from if they have any hopes of maintaining control of the House. In 2006, the Democrats wrestled control from the Republicans in the House of Representatives by campaigning on a theme of ending the Washington, “culture of corruption.” They bashed the Republicans for the Jack Abramoff influence peddling scandal, Mark Foley’s creepy cruising of male Congressional pages, and the Tom DeLay campaign finance investigation and the public responded by sending Democrats to Washington. The shoe is firmly on the other foot now. In 2008, William Jefferson, a Louisiana Democrat is serving a 13-year sentence for bribery, lost his reelection bid to a Republican, Joseph Cao. Cao captured a seat held by Democrats since 1890. Rangel’s seat in Harlem is solidly Democratic, but the Republicans don’t need to beat Rangel to use him to beat other Democrats. The longer he hangs on the longer his troubles serve as a drag on the entire party’s November prospects. Rangel has forgotten more about politics than a hundred political scientists and strategists know. He’s created an impressive legacy for a successor to match. Rangel should given them the chance to do so. He should know it’s time to let go and find the “Exit” sign. It's all smiles now, but will Obama have to pressure Rangel to quit? ← Republicans to the Jobless: Drop Dead!